Peace and Calming Essential Oil is a Relaxing Blend for you and your pets! 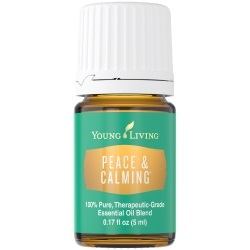 Peace and Calming Essential Oil is a very soothing blend and smells absolutely yummy! It is one of my top ten best oils, and it is a must have for me, my horses and my dogs. I use it every day at the farm for young or agitated horses. And I put it on me and around Dezie's bed (my dog) at night before we go to sleep to help us unwind and relax before bed time. You will find that children are also very drawn to this oil. I believe it’s the orange and tangerine oils combined. Do you remember as a child loving anything with orange in it? I do - orange juice, soda, candy, sherbet! And now there is also Peace & Calming II! From time to time due to supply constrains, Peace & Calming goes out of stock. That is why Young Living has created Peace & Calming II. Very similar oil---same calming affects! Yay! This is a fun and easy reference guide for Peace and Calming Essential Oil Blend. It will tell you how to use your oil blend and what to use it for. It will also provide you with some fun tips and testimonials! Want to Purchase Therapeutic Peace & Calming Essential Oil? Go to the Oil Shop! Buy Peace & Calming Oil Here! Peace & Calming Oil has been in very limited supply over the last year or so due to limited harvest of Blue Tansy. 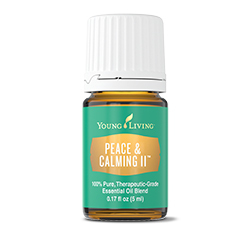 In response, Young Living created Peace & Calming II! Click here to purchase Peace and Calming II from the Oil Shop. What is in Peace and Calming Essential Oil Blend? Ylang Ylang Essential Oil (Cananga odorata) has a long history in skin and hair care products, particularly in Asia, where it is used to promote healthy, luxuriant hair*. It also restores confidence and equilibrium. Patchouli Essential Oil (Pogostemon cablin) has a sweet and rich aroma that is very beneficial for the skin*. Use to reduce wrinkled or chapped appearance. It reestablishes mental and emotional equilibrium and energizes the mind. What is the Spiritual Influence? When the mind is calm, we are able to focus and think clearly. This oil allows us to visualize our goals and dreams truthfully through our heart. It is in our heart where our true dreams live and are supported. Can this oil be used for Animals? Yes, I have had great results with this oil. I use it on a daily basis out at the barn. Young horses, like young children, are not only attracted to this oil, but need it. It helps that young horse that still does not know how to transform mental energy to a positive outlet. It also builds trust between trainer (and riders) and horse. Horses and riders should inhale it before work, or when presented with something new. Pet your dog head to toe with a drop of this oil before bed. Note about Animals: Certain oils can be very toxic to cats. Citrus products and oils in particular when not using therapeutic grade quality. Please consult your vet if you are not sure about applying any essential oil to your pet. What are the Safety Precautions? Peace and Calming essential oil has photosensitivity – direct exposure to sunlight within 24 hours after use could cause dermatitis. Generally safe for children over 2 years of age. Everyone loves the scent of Peace & Calming. Wear it as a perfume or cologne, and notice how you and the people around you feel. The smell is alluring! Combine with Lavender essential oil before bed time.